There are 11,110 items available. Please enter a number less than or equal to 11,110. Battery switch as advertised. Very fast shipping. Thanks!!!!!!!!! Smart design by the PERKO manufacture. Holes were exact same location as the existing single battery switch I replaced and added a second battery. Specific but simple connection directions. Even a novice like me was comfortable with installation. Works great. Well constructed. Thanks, I will shop again. This switch replaced one that I had on my boat the last 12 years, it finally quit working. Installed this new Perko switch and I was back in business. If you have two batteries and you want to switch back and forth between the two there is not a better switch you can use, in my opinion. Replaced an old 8501 with this switch, I didn't realize how bad the old one was until I flipped this between settings. Smooth! Sometimes.... when it's not broke it doesn't need fixing. 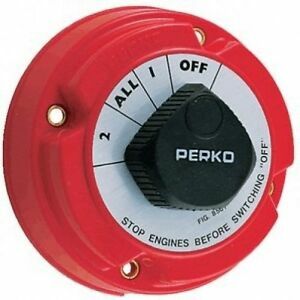 PERKO has it right - this is a great switch. Buying two more for maybe the 5th time in 10 years of this boat. They last about two years and then bind up, making battery switching and turning off/on near impossible. Have tried other brands with the same results. They are at best, a two-year product and they fail. They are smooth and do work, while they work. There are few other options available and I have no experience with Blue Sea, which are priced much higher.